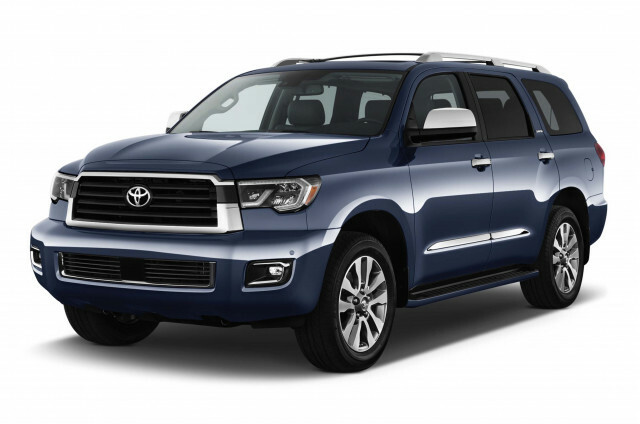 The Toyota Sequoia is a full-size SUV that's big in size and scope. It hauls up to eight people and tows thousands of pounds. Although it is the oldest design in its segment, the Sequoia benefits from its strong (if thirsty) V-8 engine and Toyota's reputation for quality. 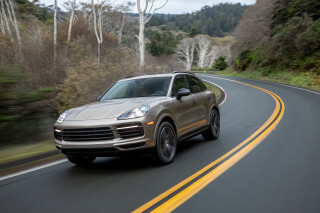 It's available in SR5, Limited, and Platinum trim levels, with a choice of rear- or four-wheel drive. With the Sequoia, Toyota has had since 2001 a rival for vehicles such as the Ford Expedition, the GMC Yukon, and the Chevy Tahoe and Suburban. Toyota added a TRD Sport edition with tougher off-road shocks and sway bars and a mildly updated front grille to the Sequoia for 2019 but left the big SUV alone for 2019. The current Sequoia was new in the 2008 model year, coinciding with a new version of the Tundra pickup truck on which it's based. Powertrains were accordingly borrowed from the Tundra. The Sequoia launched with an available 381-hp, 5.7-liter V-8 and 6-speed automatic that made it a viable, even superior, choice for towing duty compared to the contemporary light-duty trucks from Detroit. Base models got a 276-hp, 4.7-liter V-8 and 5-speed automatic. Fuel economy wasn't that much different between the two engines though—it ranged from an EPA-rated 13 mpg city, 16 highway to 13/18 mpg. All Sequoias come with three rows of seats, with the middle row offering a choice of a bench or two captain's chairs. 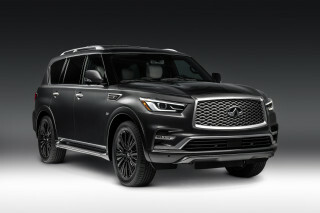 The Sequoia's highway ride in particular has been much improved and the cabin is quieter, with interior appointments now close to rivaling those of the more expensive Land Cruiser. Base, Limited, and Platinum models are available, with the Platinum getting a lot of extras, including heated and ventilated seats, heated mirrors, DVD entertainment, a navigation system with XM NavTraffic, JBL sound, and wood trim. Little has changed on the Sequoia since 2008. 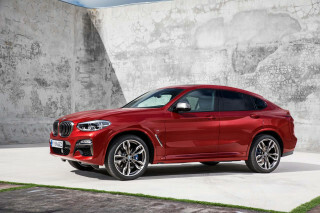 While the Tundra on which it's based has seen exterior and interior improvements, the SUV has been left out, and both have had their powertrain options shrink instead of grow or mature. The Sequoia has sizable cargo room thanks to its independent suspension design in back, but its massive size means it's not fun to drive, and poor visibility makes things difficult when it comes time to park. It's still a solid choice for those who want to tow, but it's not an efficient vehicle when there's no load to carry. Toyota has mostly added features in recent years in the absence of more meaningful changes. On 2010 models, Bluetooth, satellite radio, a USB port, and an auxiliary port were added to the standard-equipment list. The 2012 Sequoia received standard trailer-sway control and blind-spot monitors. Toyota has also been pushing its Entune infotainment systems through most of the lineup, and a new Blu-ray rear-entertainment system was added to top trims. In 2013, Toyota dropped the smaller V-8, leaving only the 5.7-liter engine. 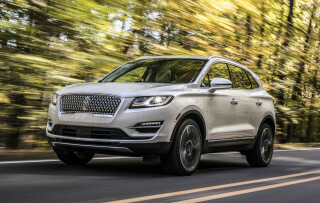 There were no changes to the Sequoia for the 2015 model year, and only minor changes for 2016, including smartphone-based navigation and more widely available safety technology. The 2017 model year is a complete carryover from 2016. The Sequoia first reached showrooms in the 2001 model year, shortly after the full-size Toyota Tundra pickup was introduced. From day one, the Sequoia has offered V-8 engines with a choice of rear- or four-wheel drive. At launch, the base engine was a 240-hp, 4.7-liter V-8 backed by a 4-speed automatic transmission, but 2005-2007 models received a stronger, 282-hp (or 273-hp) version, paired with a 5-speed automatic, which was also a bit smoother and not any less efficient. Those first-generation Sequoia models weren't exactly the pinnacle of refinement—they had more road, engine, and wind noise than some might expect in a full-size truck—and they weren't as spacious inside as rival Ford and Chevy models, but they proved themselves to be sturdy, reliable trucks. SR5 and Limited models added more luxury features, and a series of improvements phased in with the stronger engine in 2005 made the Sequoia much more appealing overall. Toyota was also a safety trendsetter in offering standard electronic stability control on all of those vehicles. Extraordinarily versitile, comfortable, safe, secure and pleasing to the eye. Great visibility. Safety features great for the model. Would add auto stop and accident prevention and rear end crash avoidance. 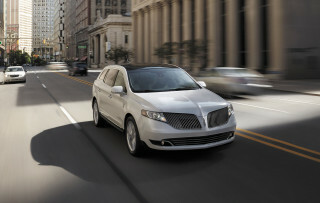 Consumer reports for the 2012 platinum gives great review. Great Vehicle overall, not happy about the recalls on airbags. love this suv. will definetly by another one.